The first of its kind, the MAATS AIRlift Rack for Electronic drums incorporates two dynamic, innovative and patented technologies that partner seamlessly creating the ultimate electronic drum rack. Patented AIRlift technology allows the player to maintain complete control of the instruments through the height adjustment range, while the Magnetic Air Adjustment Tom Suspension (MAATS) isolates electronic drums for sonic isolation and ‘real feel’ drums. Designed to eliminate the crossbar over the kick drum, the MAATS AIRlift Rack results in a more authentic drum kit aesthetic. For the first time, electronic drum pads now respond and feel like performing on acoustic drums with traditional static (tension rod) resonate enhancing suspension mounts. With the electronic drum pad now isolated in its own adjustable magnetic field, the player can personalize each pad to specific feel values. In addition, the MAATS attenuates the mechanical vibration from one pad to another. The adjustable magnetic field not only fine tunes the players feel and sensitivity, but it simultaneously contributes in mitigating unwanted double and false triggering. This groundbreaking, patent pending innovative technology has also been designed to retrofit existing Roland MDS-50KV and MDS-25 electronic racks. Integrated with a patented air suspension system, these telescoping tubes glides up and down effortlessly, ensuring easy, instant setup and positioning of the electronic drums, cymbals and controller mount while simultaneously ensuring they will not fall vertically. The result is quick, smooth and exact adjustments every time. Utilizing the MAY Stadium Hardware patented tripod system, a single leg can adjust independently of the other two legs to ensure stable, secure support of the rack, and thus the instruments, regardless of the playing surface. Ergonomic wing bolts provide even greater torque values with less effort during setup. Utilizing clevis joints on the side rails of the rack, the Pivot- Rail system provides even further adjustment by pivoting the rails in either direction (to and from) thus resulting in the preferred proximity of the instruments to the player. Specifically designed for the cymbal boom arm and articulating controller mount, AIRlift 360 creates unprecedented adjustment and effortless player positioning, without the necessity of a memory lock when performing space is limited. Fabricated out of tempered aircraft aluminum alloy, the MAATS AIRlift Rack embodiment creates an optimally lightweight result without sacrificing strength and stability. Roland and MAY partner to bring the ultimate in performance and innovation for an electronic drum kit. A perfect solution for existing electronic drum players, who want to take them electronic drum rack to another level. The MAATS AIRlift Rack is compatible with the TD-50KV & TD-30KV Roland V Drums. Available as an independent system from the AIRlift rack, the MAATS can retrofit Roland’s MDS-50KV and MDS-25 racks, and is ideal for the player who wants to elevate their existing rack. *MAATS AIRlift Rack and System only. 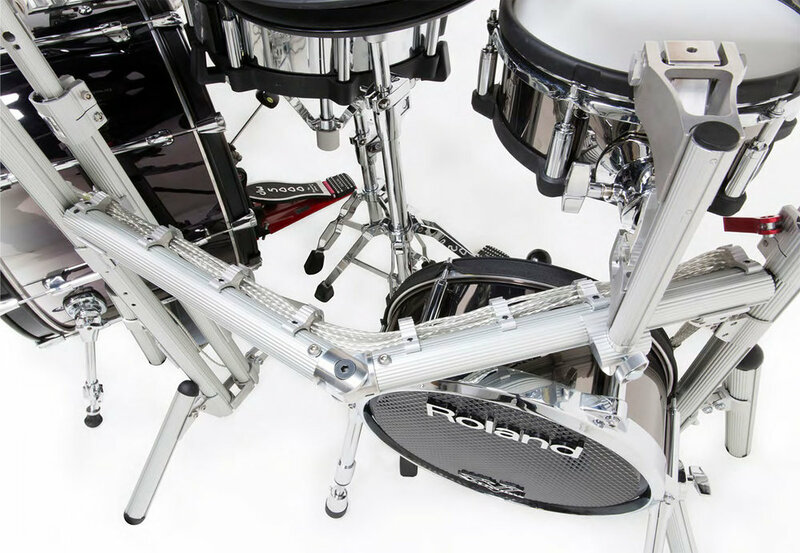 Electronic drums, cymbals and controller mount manufactured by Roland. Please see their website for further information.